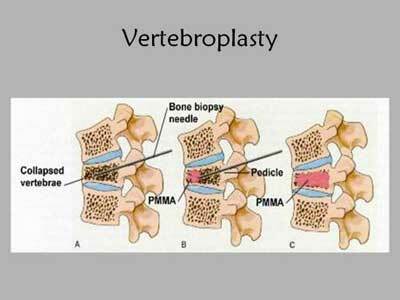 Vertebroplasty is injection of bone cement into a diseased vertebra, Percutaneously, under image guidance. This is done to provide pain relief and to strengthen the diseased vertebra. Ministry of Health and Family Welfare, Government of India has issued the Standard Treatment Guidelines for Vertebroplasty. 4. Post traumatic painful partial collapse in a non osteoporotic vertebra without retropulsion causing cord compression. Osteoporosis and malignancy have a world wide distribution. Cancer is the leading cause of death. Osteoporosis is inevitable with age. PREVENTION AND COUNSELING: Early diagnosis of osteoporosis and malignancy and their appropriate treatment will reduce the incidence of osteoporotic collapse vertebrae and of metastases. This can reduce the incidence of vertebral collapse. Radiograph Spine – shows partial collapse of vertebral body that stender. Bone biopsy to be done along with vertebroplasty if MRI suggests metastatic possibility. Vertebroplasty As required for etiology of partial collapse, such as for malignancy or Osteoporosis. Patients meeting the criteria for vertebroplasty should be referred to centers equipped with capability to perform vertebroplasty. Subsequent follow up should be if there is recurrence of symptoms. Back ache with local tenderness on the spinous process of the vertebra. i. Radiograph Spine AP and lateral views, ii. MRI Spine iii. Blood – Hb, TLC, DLC, ESR, Platelets, INR, Glucose fasting and post prandial, Creatinine. Based on the clinical condition of the patient, the procedure can be done under Local anesthesia / Conscious sedation / General Anesthesia. The patient is positioned on a Fluoroscopy unit, in a prone position for dorsal and lumbar vertebrae and supine for cervical vertebrae. A patient who cannot lie prone or supine may lie in a decubitus position. A biplane DSA unit is preferable. However the procedure can be done in a single plane fluoroscopy unit. Appropriate anesthesia / sedation is given. The Needle approved for Vertebroplasty is positioned into the anterior half of the vertebral body Under Image guidance with Image intensifier. Opacified bone cement approved for Vertebroplasty is injected into the vertebral body under live fluoroscopy, so as to diffuse into the affected vertebral body. Care be taken to avoid cement passage out of the vertebral body. The needle is removed. The patient is on bed rest for a minimum period of 3 hours. Additional restrictions are as per the anesthesia. a. In Patient: If necessitated by the general condition of the patient. b. Out Patient: Can be treated as outpatient. c. Day Care: Can be treated as outpatient.